At present there are three post offices on Long Island (out of approximately 200) that are on the list for potential short-term closure. Two are stations and one is a branch, meaning that none of these post offices has a Postmaster itself. 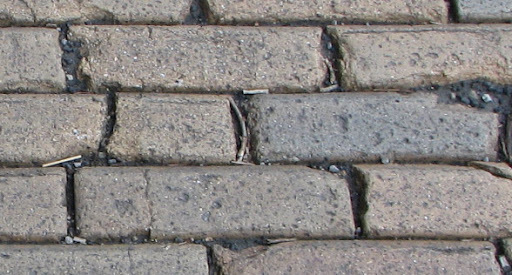 The reason I've decided to write this entry is that I've noticed that a lot of people who have found my blog are researching Bay Shore's historic Penataquit Post Office (one of said stations). I can very much envision people being attached to it, since it's such a lovely building. Furthermore, ALL THREE mail processing facilities on Long Island are slated for potential closure, and I'll cover those in my next post. Reckson Plaza is a large office park located at the southwest corner of the interchange between the Meadowbrook State Parkway and Hempstead Turnpike. Its hallmark is two glass towers connected by a central atrium. And it has a post office! Presently it's a one-clerk office that stays open during full business hours regardless. Ordinarily, there would be a lunch break at such a location. Since this post office doesn't represent a distinguishable community, I suspect its days are numbered. If the postal service holds a public meeting in the evening, when the workers at this office plaza have gone home, then there will in all likelihood not be enough people to defend it. A beautiful, positively wonderful building that's served as the town's post office since the '40s. The inside is great, too: wood paneling, old PO boxes, the works. That would be a real shame. The closest office is East Setauket, its parent, about one mile away. To my knowledge this is the first outlet to publish this information! That might be because I was able to pick up on this in person earlier this afternoon. It also apparently means my blog's an outlet now. If you've been to a post office within reasonable bounds of civilization, you've probably seen the computerized system, known as POS, that takes care of every conceivable operation that a postal clerk needs to do on a day-to-day basis. In this case, what's important to know is that the system is used to scan the back of stamp sheets being sold in order to ring them up for sale. That is, it reads barcodes and places the cost on the screen. The machines are rather sophisticated: they're coded not to allow the sale of an item before X day, not to allow it after Y day, and so forth. They require an Internet connection to the outside world so that they can obtain their data from a central USPS server. They're basically on a universal standard. 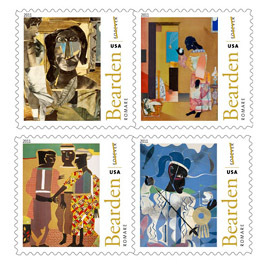 So, someone who codes at USPS screwed up: the brand-new set of four stamps honoring artist Romare Bearden, which were released for sale today, happen to come on a sheet of 16. If you've bought a sheet of stamps recently you know that most designs come in a sheet of 20. Well, if you tried to buy a $7.04 sheet of 16 stamps at any post office that uses the electronic POS system, it wanted to charge you for 20 at $8.80. By default; it's just the way these machines are. I'm guessing that in some cases it succeeded: if neither you nor the clerk knew about or remembered the error, then you could have gotten ripped off to the tune of $1.76 per sheet of stamps. Fortunately the system can be overridden, so there was a solution that clerks nationwide had to put into practice all day: Scan the barcode on the sheet, say the customer's really only buying one stamp, but then multiply that $0.44 by the 16 or however many stamps the person is actually buying. The postal service was aware of the issue and from what I hear issued a nationwide memo to all of its postal Districts. My research finds that individual offices were notified at different times: one reports receiving a fax early in the morning Tuesday (the day before the stamps went on sale), one area notified all its offices this [Wednesday] morning at 8:00, though another was notified this [Wednesday] afternoon after its District was notified of scanning issues at other locations. Since every clerk had to manually override the system in every instance regardless, it's possible that a few forgot. A fix for the issue is on the way. A source at the managerial level tells me the issue should be resolved by tomorrow; the "Universal Source" is supposedly sending out a software fix this evening. My question is, if this was known beforehand: Why in the world can't USPS change a single number in a computer somewhere to fix the problem for its offices around the country? When I first started this blog back in September of last year, it was intended to be read by just a few people. Think niche market. It was almost a personal archive. The dark design was intimate and it worked well for a while. These days, I've listed the blog on Google, it's getting linked to all over the map, and it's possible that a couple of postal managers are gauging my sanity; so I thought it was time for more of a mainstream and welcoming design change. The subject matter will remain the same, though the GP logo and images will be bigger and bolder than ever, and I might include more general postal news as I discover it. Thanks to all my readers for your support. As it stands the Rutherford Post Office could lose FOUR of its six locations as part of the Decimated "Expanded Access" initiative. 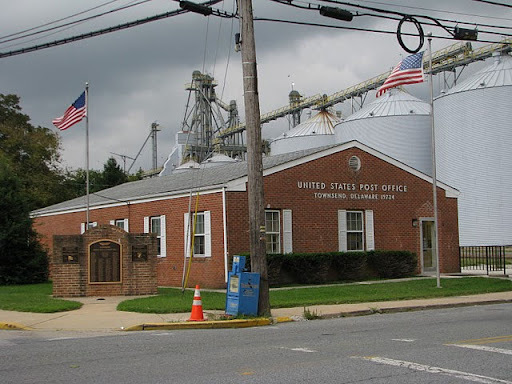 While these locations are listed as being in their own towns on USPS's online "study list", these facilities are all branches, meaning their main post office and Postmaster are in Rutherford, although the post offices lie outside the town's corporate limits. Generally speaking, these offices lie in a line, and are about a mile apart from each other. Can't believe this wouldn't make enough revenue to make keeping this around worthwhile. It doesn't look like much (something like a converted fire house? ), but there were customers in there when I came knockin'. 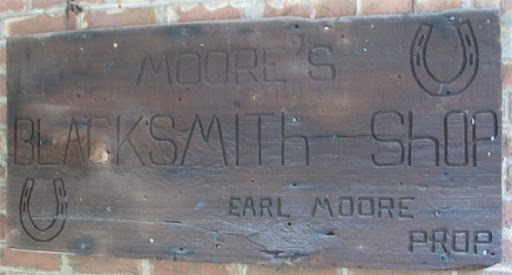 A distinct community that seemed populated enough to me; closure of this would be odd, even if it's just a mile from the Rutherford main office. This I could see as an obvious candidate for closure, as USPS carriers all across the country have been playing the postal equivalent of musical chairs as a result of centralized operations known as "Delivery Unit Optimization". It's my guess that the carriers, with their "diminished workloads", could be easily shoved into the back of the Rutherford main office, as the postal service has been doing all around the country. I'm sure this facility would bring in some money from some business looking for a warehouse. Here are some post offices in northern New Jersey that are on the Diminished "Expanded Access" study list. The address of the location: 100 Menlo Park Mall, Ste. 101, doesn't help either (a frequent issue with mall post offices, in my view). What do you think? Frankly I'm a bit surprised this is still around, because it's about a half-mile from the New Brunswick Main PO. I'm guessing slews of people wouldn't know this exists if they haven't driven past it. Even if they have driven past it, it looks more like a warehouse than a post office. That said, there were two other customers in line when I visited the PO, so I'm sure its fate comes down to revenue. 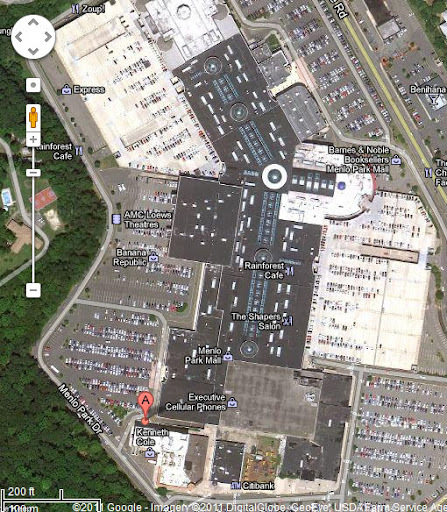 This is a section of New Jersey that has what's basically a grid of post offices, about one each mile in every direction. Regardless, this is a reasonably populated area, and there were five other customers there while I was in line. That would be a shame to close. It maintains absolutely no signage for some reason. It serves an independent community. Need I say more? If you look at the Roselle and Roselle Park post offices on a map, they are spatially only 1,500 feet apart. Obvious closure, right? Not so: the two towns are separated by a railroad line that bifurcates the local street network, so driving distance is actually 0.6 miles when you consider the nearest track crossing. Still rather close, but two distinct communities deserve two post offices. I highly doubt USPS would close both of these. So if one's going, which half of town are they gonna pick on? So I was driving around rural Fayette County, PA -- in the southwest part of the state -- a few Saturday afternoons back as part of my 86-post office weekend. Everything was closed, but it can be helpful to photograph when there are fewer cars and incomers-and-outgoers flying around. Makes things more efficient -- especially when, like me, you like to chat a lot. My AAA state map of Pennsylvania didn't even show the town of Dickerson Run, which is on the "Expanded Access" study list. Regardless, I knew it was between Dawson and Vanderbilt, PA -- each about a mile away. Common mid-late-20th-century architecture; nothing too exciting. But what I saw at Dickerson Run stopped me in my tracks; not [just] because of what the building looked like on the outside, but what I saw on the inside: mannequins modelling postal products. It is something I have never, ever seen before, and something I wish I'd have been there on a weekday to ask the Postmaster about. It's both completely absurd and brilliant at the same time. And fantastic, regardless. It looks like the pilot's got something that needs to go out, Express Mail, ASAP! Yeah. That definitely deserves an entry. Since the lobby was closed after-hours, the photos were taken through the front window. 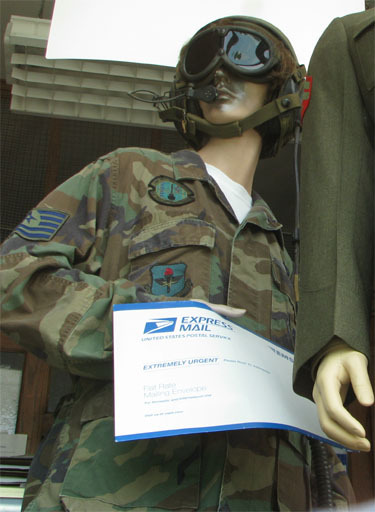 The Dickerson Run post office is likely to be closed as part of USPS's Diminished "Expanded Access" review, so see the mannequins while you can! For the record, there were a couple of very interesting and photogenic buildings in Dawson; unfortunately that's the subject for a different blog! 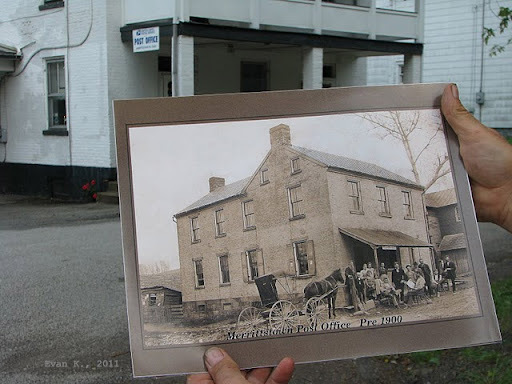 The second CPO closed April 30, 2011, and was located in the side of someone's house [10463 Claiborne Landing Rd.]. Boxes were moved to the nearby Village Hall (which was just converted from a church and inaugurated this year; packages too large to fit in such are picked up at the St. Michaels post office. The independent Neavitt Post Office, south of Bozman, MD, closed Sept. 19, 2003 due to damage incurred by Hurricane Isabel; it never reopened. Easton, MD is the area's largest town, boasting nearly 15,000 residents. For four years Easton's Tastee Freez ice cream shop on Rt. 50 [8356 Ocean Gateway] housed a Contract Postal Unit (CPU), but that closed June 30, 2011. The shop has just changed ownership and the maintenance of a CPU wasn't feasible, and the post office generally did not succeed at expanding the shop's core business. In fact, the need to maintain a qualified postal clerk at all times and to immediately accommodate any postal customers often impeded on the business's ability to serve its other customers. For the time being a blue collection box resides outside Tastee Freez's southern entrance. The Sherwood, MD post office is currently being studied as part of USPS's "Expanded Access" initiative, and could be closed within the next few months. Similarly, Easton, MD's Eastern Shore Processing and Distribution Facility could be shuttered as part of USPS's recently announced mail-slowing processing plant-eliminating proposal. First off, blog hits are WAY up since I started listing on search engines. (Okay, that makes perfect sense, but I was until recently a bit shy about having everyone being able to access at this.) Apparently people have found me by Googling various items regarding Fire Island; a Congressional office has viewed my story on Bay Shore's stately Penataquit Station (currently being considered for closure); a couple of people have been interested in L'Enfant Plaza; and the recently shut-down downtown postal trailer in Freehold, New Jersey has gotten some attention of late. (Especially since the Postal Regulatory Commission shot down an appeal to keep it open. Thanks, guys.) A person apiece has been mislead by the search engines with promises of information on Minneapolis's Elmwood Station and Bardstown, Kentucky. My apologies to those folks. * More precisely, the "Grand Central" post office Station at Grand Central Terminal. Friendly office, at least when I went. It's one of a few in New York City without those obnoxious barricading glass windows. Many stations open, a supervisor to guide you. Also security personnel. Seriously though: Do not call the actual train facilities "Grand Central Station". It's Terminal. Good, we're learning a lot today! This is actually the most expensive post office lease in the country: $2 million a year to have this basement location in the heart of one of New York's premiere tourist districts. What makes absolutely no sense is that USPS recently cut back the hours to end at 5, rather than 7. If you're spending $2 million a year for this facility, why does it matter if you spend $20,000 more on clerks' salaries? Wouldn't you want to get your money's worth from this location? A bit of a disappointing experience when I went, since all the clerks got new daters which don't say "FDR" on it, but just have their ZIP code. Boring. But this is an interesting and rather major post office, located just across the street from the what's known as the Lipstick Building [somewhat visible in the above photograph]. The lobby is open 24/7, but main postal facilities are located on the second floor, meaning you take an escalator to get to them. Can't say I've come across that before. The second floor is cavernous and features a painting from the 1980s that I was not allowed to document. Several windows open, minimal line. You can even make out a couple of people using the APC. I believe I took this photo off-hours. Think of the Bryant Square post office as Grand Central's little brother. Its hours are more limited but it still does a healthy business. They're physically about three blocks apart. In this GP entry from a few months back I detailed some post offices that share presence with train stations. I've recently found a few more, and thought it would be fun to show them off here! Quite honestly, I was surprised this thing is still around. Not to say that I wish it to be closed, but there aren't too many 3.5-hour-a-day post offices left that are within one-mile proximity to two other post offices. Indeed, the postal service has tried to shutter it on multiple occasions, but the general wealth of the community and, from my understanding, the well-connectedness of a local resident have kept this location open. Fine by me! I'm miffed because this post office closed June 17 and I didn't get to it in time. Located at the highly busy 69th Street SEPTA Station, the location was very well-used, but proximity to the Upper Darby Main Post Office was its death knell. It's close by, but considering you'd be using public transit to get to the post office to begin with, the commute would be a bit annoying because the walk crosses a convoluted set of busy and wide thoroughfares. It's the story of this location (and that of the recently discontinued Washington Park Station in Newark, NJ) which leads me to believe USPS could potentially be obnoxious enough to close the 30th Street Station Post Office in Philadelphia. This is one of my favorite of my post office photos; the post office, the train station, and the Hudson River in the background. This office is open just three hours a day, but I sure don't mind having this around! As you can see, the train station is VERY well used. Presented is just a small portion of the parking lot. No commercial establishments in this wealthy community just outside New York City in Nassau County, but they've got their post office! First floor of the train station. Media, PA: Springfield Branch @ 32 N. Brookside Rd. The new facility is located near the Mall Branch @ 1132 Baltimore Pike, in Springfield's Olde Sproul Shopping Center. It's accessible to more passers-through than the Mall Branch, but less accessible to residents close to the Springfield main streets. I visited all three today and took their photographs. USPS had been looking to consolidate up to three facilities in a new location for two years, but only replaced the two Springfield branches. There are no carriers there; Delivery Unit Optimization has placed the Springfield carriers in the Lansdowne post office, three miles away. I'm personally surprised they couldn't put the carriers in a closer office such as Clifton Heights, or a more related office like Media. The Springfield Mall post office ceased retail operations on Aug. 4 and P.O. box operations on Aug. 5. The Springfield post office closed Aug. 5 and the building is currently for sale. The new Springfield office officially opened Aug. 6. Without further ado, I hereby present you photos!